RIO DE JANEIRO, BRAZIL – Located in the back streets of Centro, tucked away in a corner a few yards behind the Centro Municipal de Arte Hélio Oiticica (Municipal Art Center Hélio Oiticica) is the unassuming facade of A Gentil Carioca gallery. There is no grand entrance or a swanky gallery sign; no shiny well-lit picture windows giving a glimpse of the inside; no well-manicured gallerist peering out in anticipation. In fact, even when looking for the gallery, the tiny stairway door entrance is mistaken for a backdoor of some shop. Inside the main hall of A Gentil Carioca gallery, photo by André Leal/Wikimedia Creative Commons License. A Gentil Carioca does not fit the typical description that many associate with art galleries. Instead it’s housed in two floors of an old colonial building from the historical area of Saara, perhaps the largest open market in South America. Its three large wooden windows on the first floor are thrown open to the sights and sounds of the streets of Rio. And that’s exactly the vision behind the gallery, as explained by the Director Marcio Botner. The gallery was set-up in 2003 by Botner, who also teaches at the Parque Lage Visual Arts School, and his two other partners Laura Lima and Ernesto Neto. All three are practicing artists and wanted to bring that artistic spirit into the running of an art space, replacing the colder commercial one found in most galleries. Involving the local community was one of the main intentions and this worked well with their location. When it opened, the gallery was the first of its kind in Rio de Janeiro that focused on promoting younger artists, experimental work, and an art education plan for the local people. The gallery was envisioned as a non-commercial dynamic space without any borders, flowing in and out of the exhibition space when needed. Botner, in fact, coins a very unusual term for the various activities of the gallery spreading awareness about art, calling it “a contamination of the minds”, talking about the viral quality of ground level outreach programs, workshops and public art. At present the gallery represents eighteen Brazilian artists, but Botner reveals that they would like to spread their wings further and take on international artists as well. Selection hasn’t been an easy task, as in the first year of the gallery alone they received over 200 portfolio submissions. However, to support and encourage them, the gallery hosts an annual exhibition titled ‘Abre Alas’ (named after the opening float of the samba parade) in which the works of many of these artists is showcased, giving them an opportunity to exhibit and be recognized. 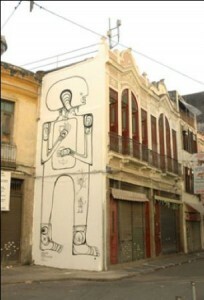 Gentle Wall Project: ‘Sem título’ by Marinho, 2006, photo courtesy of ‘A Gentil Carioca’ website. The gallery also runs two continuous projects that compliment its regular schedule. The Gentle Wall project invites an artist to propose and develop an artwork on an external wall of the gallery. Each individual artwork is sponsored by a collector and it stays up for four months. In essence, this is a completely non-commercial project whose life does not extend beyond its four months and the collector does not get to take away anything ‘physical’ for their collection. Since the project was initiated six years ago, sixteen wall art changes have taken place. The Education Shirt project on the other hand invites artists to submit a design using the world or theme ‘education’ in it. A new shirt is launched at every new exhibit opening. The gallery agenda sounds ambitious but they have managed well, all the while building quite a reputation for themselves in the art world. They are also supported by a number of committed collectors who help sustain their activities. This year the gallery represented its artists in six international fairs, such as VIP (New York), Armory Show (New York), SP Arte (São Paulo), Art Basel (Basel), Frieze (New York) and Art Basel Miami (Miami). A Gentil Carioca is a significant participant on the Brazilian art scene and one hopes that it finds more successes along its interesting journey. Watch out for the gallery in the upcoming first edition of Rio de Janeiro’s very own art fair, ARTRIO, opening on September 8, 2011. 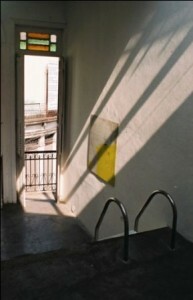 The gallery can be reached at this address: Rua Gonçalves Ledo 17, sobrado – Centro, Rio de Janeiro. More information is available on their website www.agentilcarioca.com.br which also has an English version. Very well written, and what a quaint gallery it seems like. Robust with art and a touch of gentleness. The Gentle Wall looks like a great platform for artists. keep up the good work!